Here is a gown that cannot be worn or repaired. It is very fragile. I bought it knowing this, because it is so exquisite. 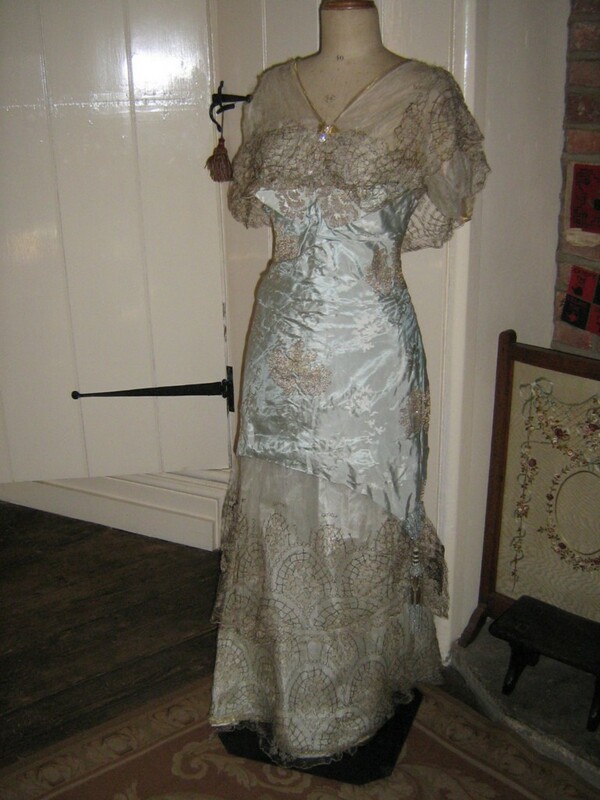 Even though my passion for costume goes back some 200 years, this is one gown I could sit and look at all day! Bought from Dickens & Jones, the famous department store in London, the lady who owned it says it was worn for a Court event. The accessory of an ostrich fan with a real stuffed bird going through it, was also for sale but I'm afraid I just couldn't cope with a real bird! 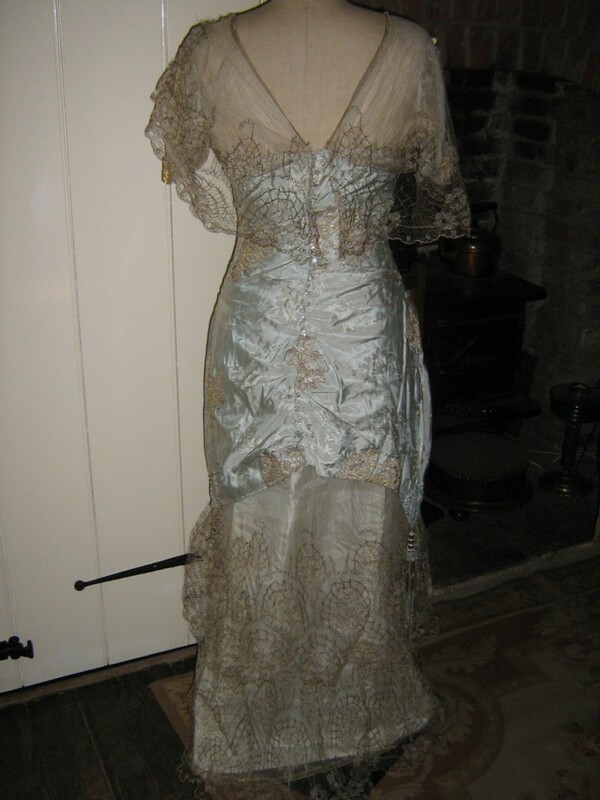 The gown dates to circa 1911/1912, so just a year or so after the Edwardian era, and now an antique. It is completely Poiret inspired and he would have been proud of it! The top layers of the dress are silk tulle and gold thread lace. The lace drapes the gown in layers, underpinned by silk chiffon with gold braid banded edges. Gold braid bows sit at the tops of the sleeves, and the gold lace forms a small train to the back of the skirt. All of the gold lace to the skirt is in amazingly good condition, which is absolutely unbelieveable. 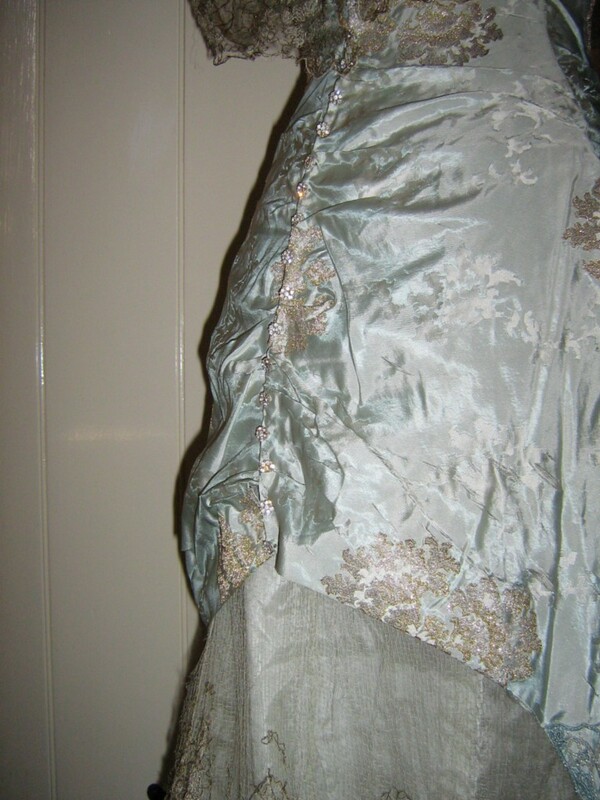 Now the base of the gown is a beautiful blue brocade, an ice blue with gold & white designs to decorate. Beautifully tailored to streamline the figure, with two fold over v-shaped panels below the bustline, and curved skirts. To the top centre front and all down the back as mock fastens are the most gorgeous diamonte buttons, so classy and expensive. Below these are hook and eye fastens to actually close the gown. And then the ultimate joy. At each side is a longer point, from which a fabulous tassel hangs. 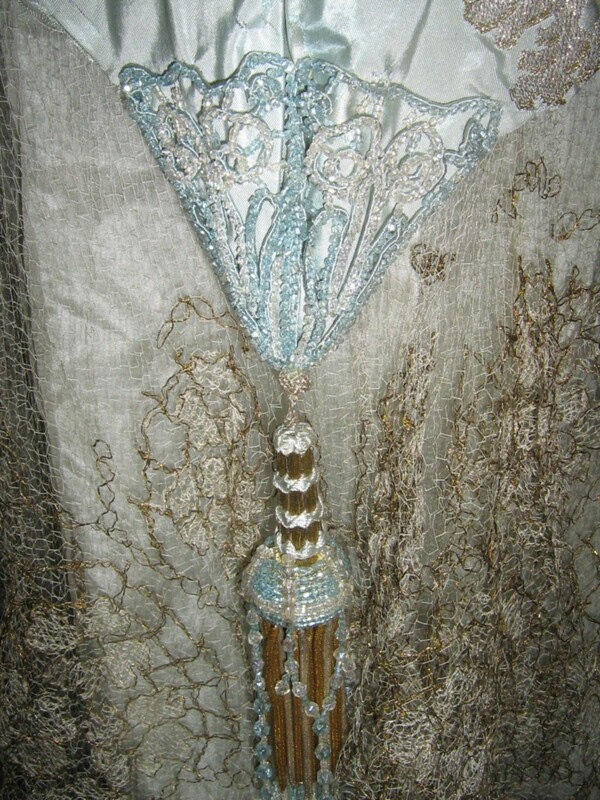 Beautifully beaded in blues, with gold curled tassels dropping next to them. These tassels are large and virtually perfect. A designers joy, and a piece of pure beauty for the collector. 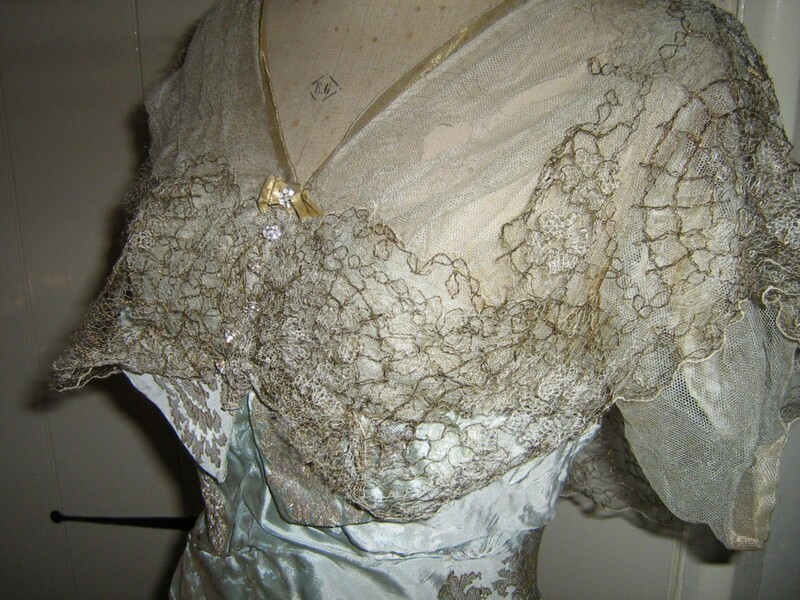 As I have said, the skirt gold lace and the beading are in superb condition, as is the silk chiffon below. The silk tulle at the front and back shoulders has shattered and part of the gold lace draped to the sides of this area has come loose and is also broken. All you could do here, I think, is re-drape the lace to cover some of the damage to the tulle, thus also covering the damage to the lace here. This will be simple to do. The tulle is also discoloured, not a major issue as it blends in with the gold! Then the main problem. The brocade is split in many, many places. 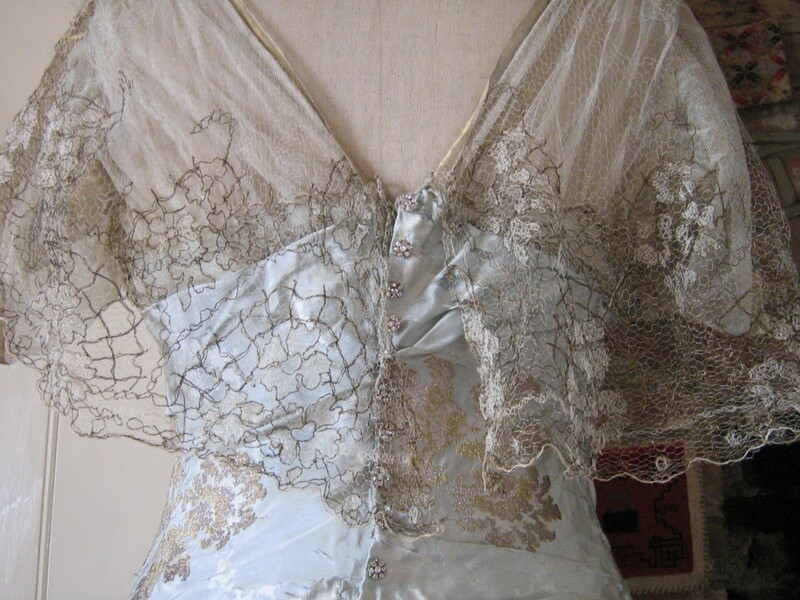 I cannot understand how the lace can be so fine, whilst the brocade has split so much. Far too split to repair, but no holes to detract from the beauty. A few of the diamonte cluster buttons have lost a single stone, but they are otherwise very clean and bright. The inside of the gown is very good, but the perspiraton pads are discoloured. 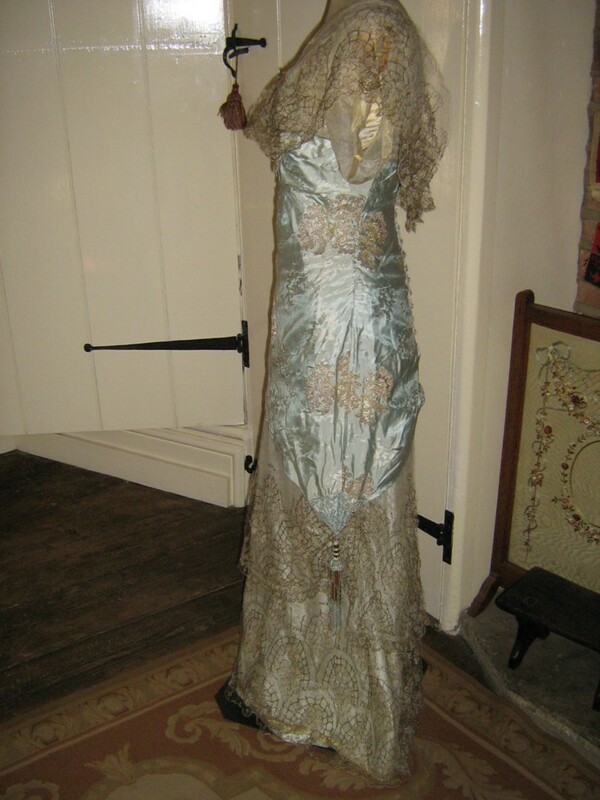 The gown will exhibit or display for many a year as long as it is kept on a mannequin and turned from time to time to prevent sun/light damage. It is far better on a mannequin than stored folded, as the spider web fine tulle and lace constantly catch on hooks and the tassels when they touch each other. A mannequin will also support it far better than a hanger. You see it on my mannequin with chest 33" and waist 23". 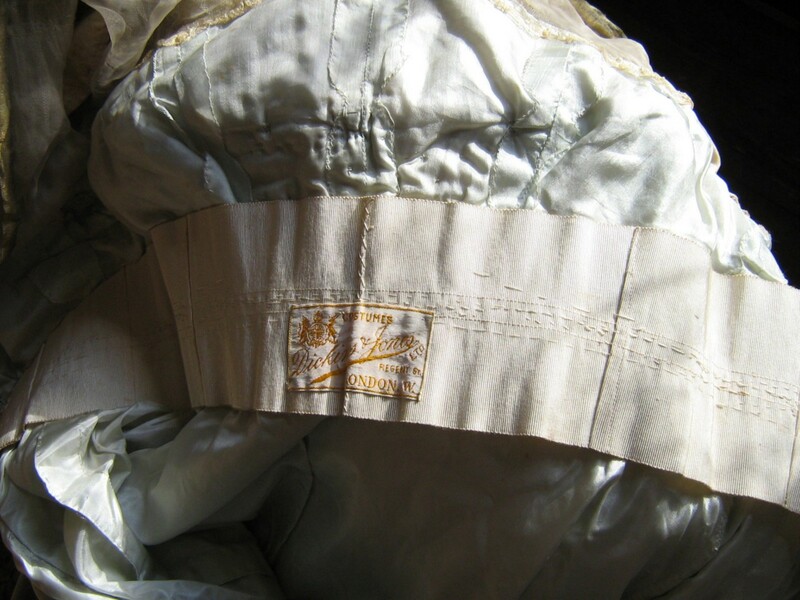 However, this only fastens the exterior fastens, not the interior belt, as the inside is far smaller. Obviously this does not matter at all for display as it is so difficult to find tiny mannequins. This gown should not be cut under any circumstances, but I think you will find that the tassels, lace and diamonte buttons are worth a lot of money in their own right. It inspires me and I'm sure it will inspire you as well! This. Is. Gorgeous. That is all.